Erected by Benjamin Dunbar Latheronwheel in memory of his wife. Ann Sutherland died 15th Febuary 1852 aged 66. 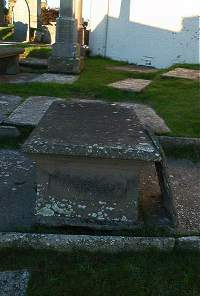 Daughter Margaret Dunbar died 28th May 1821 aged 4. Daughter Harriet Dunbar died 4th June 1821 aged 2. Son Colin Dunbar 18th August 1844 aged 17. Husband Benjamin Dunbar died at Latheron 7th August 1886 aged 90.